Interviews are easy to do badly and hard to do well – good planning, adequate time and appropriate skills are required. The type of interview should be carefully chosen to suit the situation rather than choosing a type of interview (such as focus groups) simply because it is commonly used. Interviews with children raise particular ethical issues that need to be carefully considered and fully addressed. 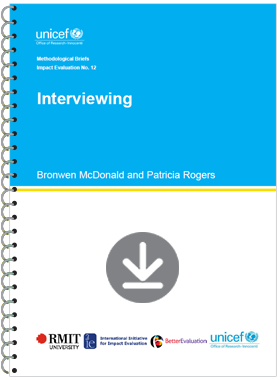 This brief outlines key issues to consider in planning interviews for impact evaluation, taking into account the purpose of the evaluation, how interview data aim to complement other data for assessing impact, and the availability of resources.